After years in the 'worthy but dull' category, Vauxhall's Astra is, at last, a car that you don't have to make excuses for. With a combination of striking looks and generous levels of equipment (standard and optional) the Astra finally rivals cars further up the automotive food chain. In estate form the car is surprisingly commodious, and successfully straddles the gap between compact MPV and full-size estate. 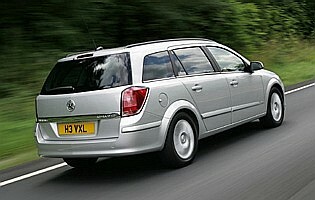 Vauxhall's Astra Estate is a rare car: a load-lugger that looks good. In recent years, the compact estate market has suffered in the face of the rising popularity in mini-MPVs. Far from being 'just high-rise hatchbacks', small people carriers came with their own warm and cuddly personality. 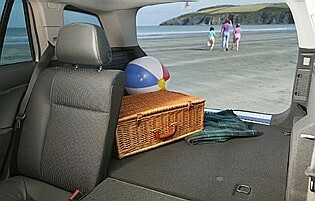 You just have to look at Citroen's Xsara Picasso and Renault's Scenic for proof. The Astra is a little different, though; its a world apart from its dumpy predecessor and a rakish, bold design in a sector where conservatism is making an unwelcome return - see Ford's latest Focus and VW's fifth generation Golf. It might look like a scaled-down Vectra Estate, but there's no denying that the Astra cuts a more dramatic dash than either of its two closest rivals. 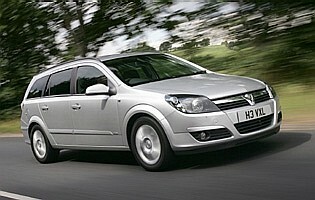 Not only is the Astra visually more stimulating than its competitors, but it also delivers on the practical front. Vauxhall should be commended for looking long and hard into what buyers actually want in this sector. The car comes with a flat load bay, numerous luggage tie-down options and some clever passive and active safety electronics. Granted, it would have been better if the various luggage restraints were standard, but what works for a family probably wouldn't appeal to a sales rep. And there's the rub: the Astra Estate is pitched largely at the fleet sector. For all the cars on-road flair - and its surprisingly entertaining to drive - it will spend the majority of its time pounding motorways and grinding through rush-hour traffic. But if you dislike the stereotypical MPV driving position and seek something that combines good driving dynamics and versatility in a small footprint, the Astra shouldn't be overlooked. Bold looks, an entertaining driving experience, a range of quality diesel engines and some innovative uses of space and technology make the Astra Estate an excellent car in an otherwise conservative market. Granted, Vauxhall sells more of this variant to the fleet sector than to private buyers, but if you want a conventional solution to your load-lugging problems, the Astra is an excellent performer.